Coal is an environmentalist’s bugbear. The use of coal to generate energy is the key reason the world is looking at a catastrophic future because of climate change. Recognising this, global civil society has given a rousing call for coal divestment, asking companies, universities and individuals to stop investment in coal thermal power plants. They want coal to go, renewables to be in. And in the interim, clean gas, also a fossil fuel, to be used as a “bridge fuel”. In this scenario any talk of “cleaning” coal to make it less damaging is untenable. This will not work for us in India. We have a huge energy deficit, with millions of households without power for basic lighting or cooking. We have to address access to energy as much as the environmental problems of unclean power. We need to push for renewable—not because we can afford to do without coal, but because this source of energy provides us the option to leapfrog to decentralised and off-grid power. But equally, and perhaps even more important, is to clean coal power so that it does not destroy the environment and take human lives. This is what my colleagues at the Centre for Science and Environment (CSE) have done. They have taken apart—quite literally—the thermal power sector in India and plant-by-plant looked at what is the efficiency rate, the pollution load, the management of waste and the compliance with environmental standards. Their findings, published in the report, Heat on Power: Green rating of coal-based thermal power plants, concludes that our plants are way behind the global best in terms of performance. More importantly, it speaks of the dire crisis in the power sector in the country, where the obsession is to build more plants and not fix what is clearly so completely broken—supply of affordable power to all. Of the 47 plants surveyed—accounting for roughly half the installed capacity in India in 2012—only 12 had efficiency higher than 36 per cent, which touches China’s average. The Indian average, pulled down by dated technology and poor resource management, was a low 33 per cent. Worse, the plant load factor has been declining in the past few years, going down to a low of 65 per cent in 2013-14, as compared to 79 per cent in 2007-08. This clearly speaks of the mismatch between demand and supply, as state electricity companies struggle to buy power, even cheap power. This then affects the CO2 emissions from the plants. India’s average was 1.08 tonnes of CO2/MWh, 45 per cent higher than the global best and 14 per cent higher than China’s average. Clearly, a huge opportunity for India is to improve efficiency and to replace its existing stock of plants—not build new ones—with best technology. This is not the only challenge. The fact is that power plants pollute air, consume water and dump huge quantities of waste, namely fly ash. Indian plants have a long way to go to clean up this mess. This is not a small matter. My colleagues have estimated that this sector alone is responsible for 70 per cent of the total freshwater withdrawal by all industries; over 60 per cent of the particulate matter emissions; 50 per cent of sulphur dioxide emissions and more than 80 per cent of mercury emissions. So, if we clean this sector, we make huge gains in cleaning pollution from India’s industrial sector. Doing this requires first setting standards that are stringent and usher in best technology and management, and then ensuring that monitoring is rigorous and verifiable. CSE has found that most plants either contract out pollution monitoring to third-party laboratories or have set up online emission monitoring systems. But in both cases data is poor and systems unaudited. This is particularly important because no pollution board has the capacity (or authority) to shut down a power plant for obvious reasons. The biggest issue is gainful use of fly ash since India’s coal is of poor quality. For every tonne of coal burnt, 35-40 per cent is generated as waste. Just consider the scale of this problem: over 40 per cent land area of power plants is used to dump ash. Over 1 billion tonnes of ash is lying unused today and to this over 160 million tonnes are added each year. Everything we have done till date, including specifying the use of ash in cement manufacturing and bricks, is not making a dent in the gargantuan pile of muck. So a clean-up is essential. But for this India’s power sector must also come clean. The CSE project requires companies to voluntarily share data. It was India’s largest power generator, NTPC Limited*, which refused public scrutiny. This will not build a cleaner future. Ultimately, this is the real agenda for reform. Most of the problems related to the environment are because of the corruption and nepotism prevalent in the system. The Pollution Control Boards and Committees are full of people (majority of them) with people who are taken in on account of their political and other affiliations and connections and not on account of their capabilities. Obviously, they are more concerned to keep their mentors and their real 'bosses' pleased than doing their jobs. In the process they also make huge amounts of money by way of 'gifts' and bribes. Till the time the appointments are made on such considerations, nothing much should be expected. Distributed generation (DG) and its rapid spread is the antidote to this malaise. As Buckminster Fuller said, Ã”Ã‡Â£To change something, build a new model that makes the existing model obsoleteÃ”Ã‡Ã˜ The entrenched interests in coal can be made irrelevant through DG. Why has India not succeeded in solar home systems and their rapid deployment as Bangladesh has done? Electricity ought to be a cottage industry for basic lighting, phone charging, fans, and even TVs - no large companies in generation and distribution needed. What policies can foster this grass-root development? I did not see this merit sufficient attention at the RE INVEST conference in Delhi in February. I'm glad we're not talking about carbon capture and storage (CCS) - and rather are discussing reduction in emissions production itself. The questions remains, why aren't we able to put our act together in the coal based Power Sector (and others for that matter)? I would agree with DR HAQUE that our deliberately crippled Centre or State PCBs are generally full of the corrupt and the connected and NOBODY can do a damn about it. The next stage is that even when PCBs want to act, can they or will they be allowed, given the political and economic primacy accorded to Industrialism, no matter at what cost? What rankles is that there is no one you can turn to with your questions and expect to get an honest answer leave alone ACTION. To write "Is anybody listening" etc.is fooling yourself into believing that our well chosen ministers read things like DTE! Thank you for drawing our attention to this urgent issue. The issue calls for immediate and serious attention, involving all stakeholders. In fact, we could find economically attractive solutions as well. For example, improving the plant load factor, using fly ash for cement manufacturing and bricks making, tapping of waste heat etc. could all lead to greater efficiency, which should help the bottom line of the power companies. What is missing is a will at the national level to do something positive. It is easy to put the blame on corruption, and feel good. But that is not going to help at all. Could CSE try to push forward this agenda, and draw the nations attention to this urgent problem? How could individual citizen help? We need a mass educational movement, because the future of our own children are at stake. The post / article on "How power can be cleaned" deals on problems. Coal can be used for liquid fuel production as in case of China or can be used via tri-reforming in Sasol-Jindal JV model. Alternatively, green 'bio-coal' or torrefied wood pellets can be used as bioenergy source. I have been working hard on a comprehensive Project to wean our unhealthy and illogical love for coal powered plants to generate electricity. Besides degrading environmental pollution (ash piles too) and causing Public Health Crisis, thermal plants (coal) are impractical for want of sufficient domestic coal supplies and dependence of humongous quantities of water for cooling towers and steam generation. 1. Small Commercial Solar Power Plants of 5 to 10 MW in each Mandal or Tehsil (comprising 25 or so villages) generating 8 to 16 million units of power. These power plants will be allotted to small local private investors. The State governments will offer guaranteed reasonable tariff for purchasing power (Power Purchasing Agreements) for 25 years. There is no pressure on the governments to provide Capital and Land but only to provide some relief through lower interest rates and facilities for power evacuations to the Grid. 2. Installing 5 KV Solar PV arrays to supply power to the irrigation pumps in farmer's fields making them self-sufficient in power and even supply excess power to the Grid. 3. Making it mandatory for every public and private institutions like schools, colleges, universities, office complexes, commercial establishments, hospitals, etc. to generate at least 30% of their electricity needs through Rooftop Solar installations. These three innovative steps will eliminate the need for any new thermal plants and even gradually retire a significant percentage of old ailing ineficient polluting thermal power plants. I have spent my money and time for the past 10 months but there is little action on the aprt of Telangana State. Your article is superb highlighting the root cause of the problem. I salute you Madam and Down To earth in general for the critical analysis of Energy and environment problems facing the country. 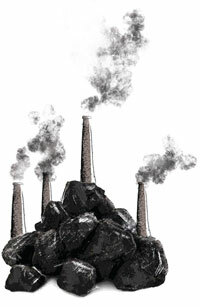 Coal constitutes about 66 per cent of the fuel used to produce roughly 210 giga watts of electricity. At roughly 210 giga watts, India is the fifth largest electricity generator in the world, of which 66 per cent comes from coal. In 2011-12, IndiaÃ”Ã‡Ã–s 111 coal-fired power plants mostly based in north and central India with a total generation capacity of 121 GW, consumed 503 million tons of coal. It generated an estimated 580 ktons of particulates with diameter less than 2.5 â”¬Ãm, 2100 ktons of sulfur dioxides, 2000 ktons of nitrogen oxides, 1100 ktons of carbon monoxide, 100 ktons of volatile organic compounds and 665 million tons of carbon dioxide annually. Not all states and regions bear the brunt evenly. The largest impact is felt over the states of Delhi, Haryana, Maharashtra, Madhya Pradesh, Chhattisgarh, the Indo-Gangetic plain, and most of central India. Some of the largest clusters are concentrated in South-central India such as Janjgir-Champa (30,470 MW) and Raigarh (24,380 MW) in Chhattisgarh; 22,380 MW within 10 km of Krishnapatnam Port in Nellore district (AP) and 51,218 MW in the area adjacent to Reva, Sonbhadra, Sidhi and Allahabad. In Nellore district 24 coal based power plants with aggregate capacity of 23,654 MW are going to come up within a radius of about 25 kilo meters. Environmental impact of each plant is being assessed separately. There was no attempt to examine cumulative impact of all these power plants put together. This itself shows inadequacy of SPCB in exploring environmental threats posed by these coal based thermal power plants. Even when there are complaints on violation of pollution norms there was little that the SPCB did. It does not have personnel or financial muscle to take pro-active action. As far as Krishnapatnam port is concerned safe handling of coal at the port yard should be ensured. I have first hand information of coal dust in the neighbouring villages of Krishnapatnam Port. This dust falls on the trees and one can see its effect when one is under these trees when sudden rain comes. I myself experienced it. Adequate pollution free measures from Thermal plants in the area are needed. As Port is the key for setting up industries and restoring Buckingham Canal,there will be rapid growth both economic and Industrial of Nellore District in general and Krishnapatnam area in particular. How many clearances needed to set up coal thermal plants but still they are centres of controversy. As one American Cynic put it,"You Indian Guys are better than Bill Gates in creating Windows"! "Installing 5 KV Solar PV arrays to supply power to the irrigation pumps in farmer's fields making them self-sufficient in power and even supply excess power to the Grid". I read about the Solar Pump. Ã”Ã‡Â£The motor works for 300 sunny days a year, between 8.30 a.m. and 5.30 p.m., making use of the prevailing heat conditions in the StateÃ”Ã‡Ã˜. This is not true. The Maximum solar insolation occurs between 11 am to 3 pm when reasonable quantity of water can be pumped. 300 sunny days for the motor working is a tall claim. I have done extensive research on Solar Water Heaters, Solar Driers and Solar Disinfection and can authoritatively predict the optimum time a solar gadget works. The same applies to solar pump. Under Energy Park a Solar Pump was given free to an Engineering College. There the water depth is around 150 feet. As we could not find suitable farm,the solar pump is used to pump water from a sump(collected from bathrooms) to the nearby water tank. Ã”Ã‡Â£Staying grid-independent eliminates the scope for electrocution deaths in the fields, while the other major advantage of power supply during daytime (from sunshine) is the reduction of scope for snake bites and attack by wild animals in forest fringe villages.Ã”Ã‡Ã˜ This is amusing. There are 13 lakhs of Electric Pump sets in AP and in the country 2.6 crore. How many snake bites were reported? Ã”Ã‡Â£The government is actively promoting the scheme not just for the green component, but also to avoid the whopping Rs.30, 000 subsidy per 5HP agricultural motor per annum, which it incurs in supplying free powerÃ”Ã‡Ã˜. An Efficient Electric Motor costs around Rs 25,000. If we calculate the cost of the old motor and Rs 2,000 as BeneficiaryÃ”Ã‡Ã–s contribution ,net cost will be Rs 20,000 per Motor. So the subsidy incurred for motor per year can be met to replace the old and inefficient electric motor. Assuming that the Electric Motor lasts for 15 years, enormous saving of power. In our fields we replaced 6 Motors with efficient ones (Without anybodyÃ”Ã‡Ã–s insistence) and now the water availability has increased substantially. Instead of going in for new plants for power generation (especially coal based) which takes atleast 2 years to get numerous clearances, Energy saving and Energy Conservation yields quick results. I do not think there is any dearth of technological 'fixes' (and fixers) and alternate uses and paths to pressing problems like coal fired electricity and its damaging by-products. The question is why are we not able to do it? Is it because we regularly elect uneducated and incompetent Ministers or is it largely because we and therefore 'they' are corrupt?